Press the Lock/Power button on the top right side of the display tablet to switch the unit on. The system boots up, and shows the lock screen. Press and drag the inner ring to the edge of the circle to unlock the screen; the Autel MaxiSYS MS906 Job Menu is shown. Almost all operations on the display tablet are controlled through the touch screen. The touch screen navigation is menu driven, which allows you to quickly locate the test procedure, or data that you need, through a s eries of choices and questions. Detailed descriptions of the menu structures are found in the chapters for the various applications. 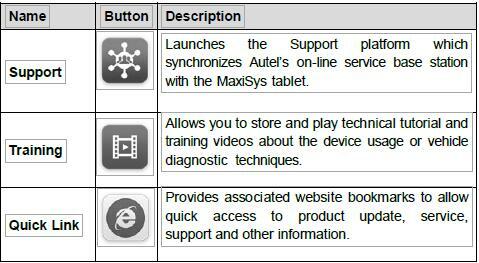 The Application buttons configure the Maxisys for the type of operation or activity to be performed. 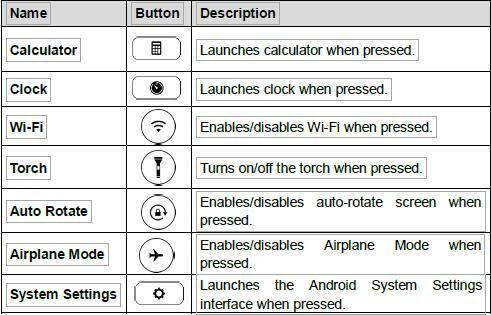 The table below gives brief descriptions of the available applications. Use your finger tip to select an application from the Job Menu. 1. Tap the Camera button. The camera screen opens. 2. Focus the image to be captured in the view finder. 3. Tap the inner blue circle. The view finder now shows the captured picture and auto-saves the taken photo. 4. Tap the thumbnail image on the top right corner of the screen to view the stored image. 5. Tap the Back or Home button to exit the camera application. 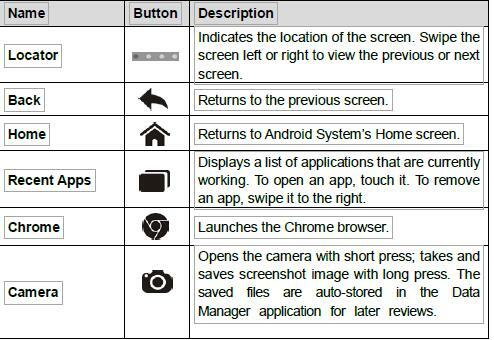 These are the standard status icons of the Android operating system. Your display tablet is a fully functional Android Pad. Refer to Android documentation for additional information. All vehicle communications must be terminated before shutting down the display tablet. A warning message displays if you attempt to shut down while the display tablet is communicating with the vehicle. Forcing a shut down while communicating may lead to ECM problems on some vehicles. Exit the Diagnostics application before powering down. 1. Press and hold the Lock/Power Button. 2. Tap Power off option. 3. Tap OK; the tablet will turn off in a few seconds. In case of system crash, press and hold the Lock/Power button for 8 seconds to reboot the system. 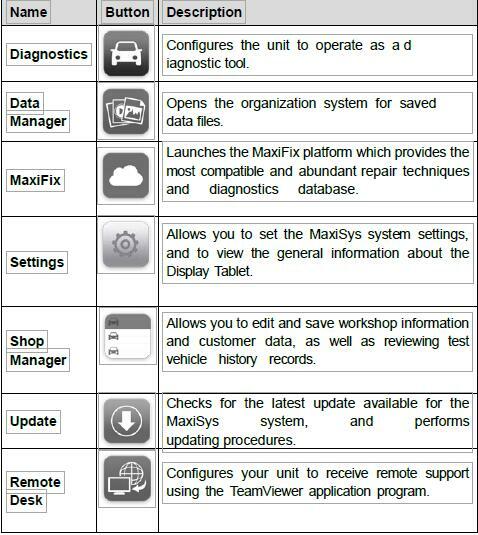 The MaxiSys Diagnostic Platform allows you to realize some of its functions on a c omputer to enhance capabilities and i mprove user experience. To realize these functions on a computer, you need to install certain software. 2. 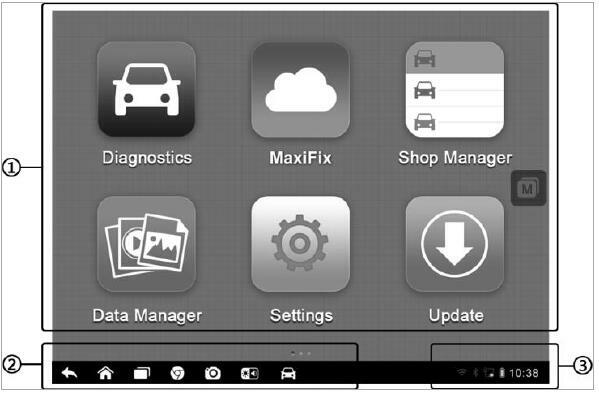 Make sure the obd2tool.com MS906 tablet is connected to the computer network, either via Wi-Fi or LAN, before printing. This entry was posted in Autel Tools and tagged Autel, Autel 906, Autel DS708, Autel MaxiSYS 906, Autel maxisys ms906, Autel MaxiSYS MS906 Review, autel ms906, Autel MS906 MaxiSYS, Autel MS906 Reviews, MaxiSYS, MaxiSYS 906, MaxiSYS MS906, ms906. Bookmark the permalink.